Have you ever wondered, is he the one? You stayed because you saw potential, were hopeful and just didn’t want to give up after investing so much time. Maybe the relationship was difficult and full of drama. Looking back you wonder why you stayed as long as you did. Or maybe the relationship was good, but it never felt good enough. Years of love and heartbreak have taught you valuable lessons, and now you’re ready to find your love – the man you’ll share your life with. You really want to get it right this time! But how can you tell if you’re in the right relationship (or if you need to move one and stop wasting valuable time)? How can you tell if he’s “the one”? I teach my clients the best way to find the right man is to end things with the wrong man right away. But sometimes it’s hard to know if you should stay or let go. Especially if the guy you’re dating has great qualities and you really care about him. To make things a little less confusing for you, I’ve put together a list of 15 questions to ask yourself when you’re trying to figure out if the man you’re dating is the right person for you. 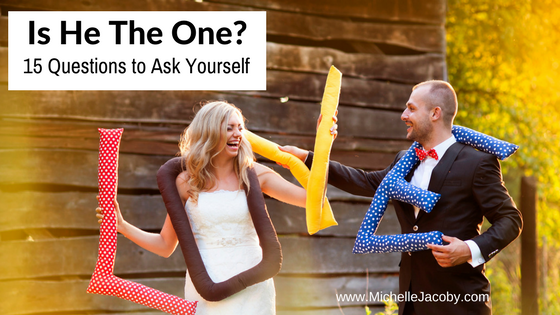 These questions will answer the difficult question, “Is he the one”? Take your time, carefully consider each question, and really be thoughtful about your answers. Is the relationship easy and enjoyable at least 95% of the time? Can I trust my partner 100%? Can I be myself with him? Does my partner love and respect me (exactly as I am)? Do I respect my partner? Is my partner supportive of my dreams and endeavors? Do we communication openly, thoughtfully and honestly? Do I love touching him? (If you have kids) Is this union in the best interest of my children? Do I feel comfortable and at ease in this relationship? And lastly – Do I feel happy in general while in this relationship? If you answered, “yes” to all 15 questions, you’ve probably got a keeper on your hands! And if you answered “no” to any of them, you may be wasting valuable time. Do NOT invest in someone who isn’t fully invested in you. And don’t EVER stay in a stressful, hurtful or abusive relationship. The right relationship will take some work, but it won’t be hard. The right relationship will enhance your happiness, not deplete it. When you’re with the right man, you’ll feel safe, relaxed and comfortable. And you’ll know he’s got your back and you’ve got his too. It will feel so good to finally get it right and to know, for sure, that he’s “the one”.